We are from México City. It began when MJ (13 months old then) woke up on a February Saturday at 4 AM with light fever. 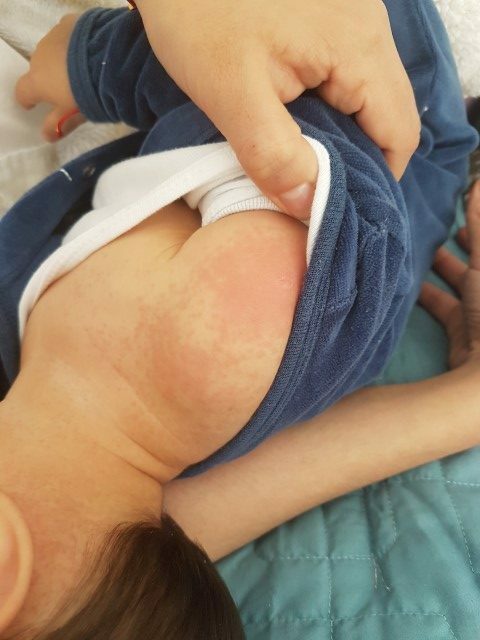 At the morning we noticed a rash on his neck and especially strong in the area where he had applied the BCG vaccine 6 months ago (which is normal to be applied to every kid in México). The rash later spread to all his body, especially his thorax and genital area. We went to his doctor who diagnosed a viral infection and prescribed paracetamol to reduce the fever and just wait till the symptoms of the infection faded away. The fever only disappeared for short periods of time and endured all weekend. On Monday we took him back to his doctor, who saw symptoms of early dehydration and sent us to the hospital. MJ was admitted and had blood tests and an ultrasound on his belly. The blood tests indicated hepatitis, which was corroborated with the color of his urine and feces. The ultrasound didn´t reveal anything important. The doctors said the hepatitis was most likely as a reaction to the viral infection. MJ was admitted for hydration via IV. On Tuesday the head doctor of pediatricians first mentioned Kawasaki disease, but it was unlikely because MJ didn´t have most of the symptoms. He only had the fever and the rash. His eyes were slightly red, but more yellowish because of hepatitis. They changed the paracetamol to ibuprofen to protect the liver, but the fever persisted. He did pass 24 hours without a fever from Wednesday to Thursday, so we thought the infection was fading away. But on Thursday afternoon (the fifth day) it came back. The doctor ordered an ECG, that revealed that his coronary arteries were dilated: the left at 3.7 mm and the right at 3.3. This is where they diagnosed KD and immediately applied immunoglobulin, two flasks within 12 hours and daily doses of aspirin. MJ improvement was quickly seen, he stayed at the hospital until the next Tuesday for prevention. It was really hard seeing our baby battling against this terrible disease, first where they mentioned his liver was affected, then to the uncertainty of his diagnosis, and then to a disease that we had never heard of, that has already affected his arteries. Fortunately, at his further check-ups, everything went better. After two months his arteries were back at normal dimensions, and his liver was also ok. We are very fortunate to have our son treated by a doctor who did know Kawasaki disease very well, so his treatment came right on time, even when it was an incomplete Kawasaki, harder to diagnose. Gladly, my baby boy is living a normal life now. Viral infection, paracetamol for the fever. then ibuprofen. Are you a KD family? We would love to talk with you and learn more about your experience with Kawasaki Disease. ©2017 Kawasaki Kids Foundation • All rights reserved. Fund research at Children’s Hospital Colorado to find a cause and cure for Kawasaki Disease. Raise awareness to decrease the chances of Kawasaki Disease being diagnosed outside of the critical 10 day window. Help families who aren’t able to afford medical and travel expenses. Save children’s hearts and lives from the threat of Kawasaki Disease.